Days after President Donald Trump pulled out of the Iran nuclear deal, tensions in the Middle East have spiked sharply, raising concerns that the pending US Embassy move to Jerusalem will further ratchet up conflict with unpredictable outcomes for the Middle East. For weeks, the State Department has been working to bolster security at US diplomatic posts around the Muslim world in advance of the embassy move, anticipating possible violence even as administration officials say the issue no longer galvanizes the Mideast the way it once did. The embassy move, they say, will eventually lead to greater regional stability. But the embassy transfer, set for Monday, will come just days after Israel and Iran traded blows across the Syrian border, firing missiles at each other Wednesday and following up with bristling threats in a steep escalation of tensions. The US decision to abandon the nuclear accord and recognize Jerusalem as the Israeli capital has made a combustible region -- one with four ongoing conflicts -- potentially all the more explosive, some analysts said. "In this highly tense situation, we've now poured gasoline on the fire by removing the Iran nuclear deal, which provided some semblance of constraint," said Bruce Riedel, a former CIA officer who now directs the Intelligence Project at the Brookings Institution. Former Mideast negotiator Dennis Ross, speaking on NPR, said Trump's decision to abrogate the terms of the nuclear deal is likely spurring Iran to show the US that it will pay a price. On Wednesday, Iran launched some 20 missiles from Syria toward the Israeli-occupied Golan Heights, according to the Israeli government. Riedel added that Trump is now "only a few days away from throwing another can of gasoline on the fire by moving the embassy to Jerusalem. It's very dangerous. It's sending the signal that the United States wants to confront Iran, and that's a signal that the Israelis and the Saudis are all too eager to hear." On Friday, the White House issued a statement condemning Iran's Revolutionary Guard Corps. Pointing to missiles fired at Israel from Syria and missiles fired into Saudi Arabia by the Iran-backed Houthi rebels in Yemen, the White House said the events of the week are "further proof that the Iranian regime's reckless actions pose a severe threat to regional peace and security." The embassy move is a contentious issue for Palestinians, who hope to claim part of Jerusalem as their future capital, and for many in the Arab world as it is home to some of the holiest sites in Islam. Palestinian commentators have noted that the timing of the move feels like salt in a wound, as the ceremony will take place on the anniversary of Israel's founding -- a day they call the "Naqba," or "disaster," because hundreds of thousands of Palestinians were forced to flee their homes. The issue has been so thorny and emotionally fraught that international negotiators had left the question of Jerusalem to the final stages of any peace deal. Trump administration officials say the move is simply a recognition of a reality and that they do not in any way intend to prejudge the outcome of final borders or sovereignty in a peace deal. Speaking to reporters on Friday, officials also insisted that the move won't set the region aflame. "The decision was made because it was viewed to be in the best interests of the United States and something the President had promised during the campaign," said David Friedman, the US ambassador to Israel. "The Israelis are obviously desirous of this, and they've requested this, and they're very happy by it," Friedman said. When asked if the Israelis had made any concessions in return for attaining a long-held goal, Friedman said, "There was no give and take with Israel with regard to this decision." The National Security Council's senior director for strategic assessment, Victoria Coates, said the question of Jerusalem wasn't the flashpoint it used to be, and pointed to a tweet from Bahrain's foreign minister saying Israel has a right to defend itself. "To see a Gulf nation, an Arab nation, like Bahrain come out, recognize Israel as a country -- which is something -- and then a country that has the right to defend itself against a country like Iran ... I think is really powerful, and to make it three days before the embassy move, I think it shows you that the President is absolutely doing the right thing here," Coates said. "It is not upsetting any regional balance; in fact, his leadership is what's bringing the region together." Friedman added that "there are people who are happy with the decision, there are people who are unhappy with the decision. I think it's far too early to be measuring reactions." In the long run, he added, the administration is convinced that the Jerusalem decision "creates an opportunity and a platform to proceed with a peace process on the basis of realities rather than fantasies, and we're fairly optimistic that this decision will ultimately create greater stability rather than less." Even so, the State Department's security wing has been preparing for weeks to bolster security at embassies throughout the Muslim world in the event there is violence, according to an administration official familiar with the planning. The region is already on edge. In the most direct confrontation between Israel and Iran to date, the archenemies exchanged fire for hours over the course of a volatile Wednesday night in the Golan Heights. Syria said the Israeli attacks marked a new phase in the conflict there, and vowed to retaliate. 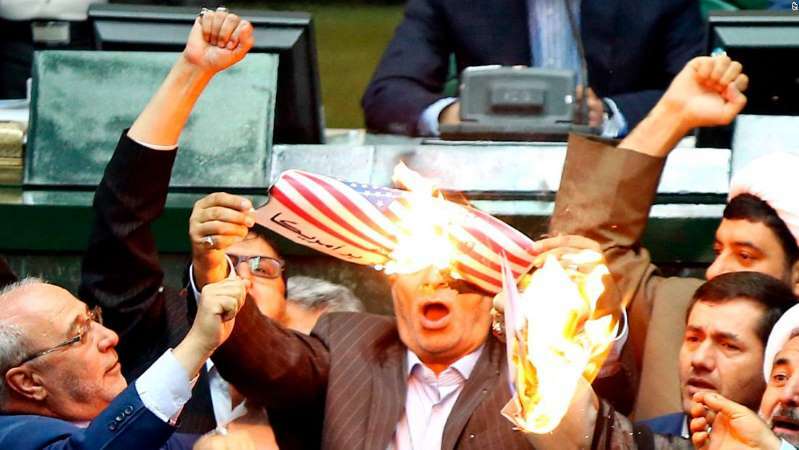 The fiery barrage came less than two days after Trump reimposed nuclear-related sanctions on Tehran despite the opposition of European allies and Russia, and despite repeated confirmation by a UN agency that Iran was complying with the 2015 deal. On Friday, Iran's foreign minister, Javad Zarif, doubled down on Iran's right to enrich uranium, even as the country seeks a path to maintain the nuclear deal with the other adoptees. "The President of the Atomic Energy Organization of Iran has been tasked with taking all necessary steps in preparation for Iran to pursue industrial-scale enrichment without any restrictions using the results of the latest research and development of Iran's brave nuclear scientists," Zarif posted on his official Twitter page. While global capitals issued calls for calm, the White House issued a staunch defense of Israel and a warning for Iran. The administration "strongly support Israel's right to act in self-defense," the White House said in a statement Thursday. "The Iranian regime's deployment into Syria of offensive rocket and missile systems aimed at Israel is an unacceptable and highly dangerous development for the entire Middle East," the statement said. "Iran's Islamic Revolutionary Guard Corps bears full responsibility for the consequences of its reckless actions, and we call on the IRGC and its militant proxies, including Hezbollah, to take no further provocative steps." Israel has tried to get Russian cooperation to restrain Iran in Syria, but largely failed. On Wednesday, Israeli Prime Minister Benjamin Netanyahu flew to Moscow to meet with Russian President Vladimir Putin to discuss military coordination. Just hours later, Israel sent a barrage of rockets into Syria in response to the Iranian rocket attack on the Golan Heights. Syrian state media reported that the country's "air defenses intercepted dozens of Israeli missiles, some of them destroying a radar site." An ammunition depot was also hit as "Israeli missiles targeted a number of military positions," SANA said. Lebanon's military issued a statement saying that four Israeli warplanes violated Lebanese airspace early Thursday. Netanyahu issued a video statement on YouTube declaring that "our operations are against Iranian targets in Syria, but if the Syrian army will act against us we will act against them." He also called on the international community to prevent Iranian "Al Quds" forces from basing in Syria. "We need to unite to dismember the arm of the evil that is spreading itself in every place," Netanyahu said, adding that Israeli "policy is clear. We will not let Iran base herself in Syria." The sudden escalation sent shudders of alarm worldwide. UN Secretary-General Antonio Guterres, who has warned for months that the conflict in Syria could spiral into a global conflagration, urged "an immediate halt to all hostile acts and any provocative actions to avoid a new conflagration in the region." The European Union called on all regional actors to "show restraint and avoid any escalation." Russia, the UK, Germany and France called for restraint, diplomacy and calm on both sides. The French Foreign Ministry said President Emmanuel Macron believes that the way to reduce tension lies in renewed negotiations with Iran on a broader deal "that will include its nuclear activities and its ballistic missile program as well as the search for a solution to the crises in the region." Riedel noted that the US was no longer playing the role it has traditionally occupied in the Middle East. "Normally in this scenario," he said, "the United States would be the leading voice counseling restraint, but that's no longer the case." Jamie Crawford in Washington, Hamdi Alkhshali in Atlanta, Mike Schwartz and Elise Labott in Jerusalem, Nadine Schmidt in Berlin, Nada Bashir in London, Mary Ilyushina in Moscow, and Kristina Sgueglia and Richard Roth in New York contributed to this report.